After checking out of the Wigwam, we stayed in Holbrook, Arizona specifically until 10 am to visit the Rainbow Rock Shop. Holbrook, a once-thriving stop along Route 66, has to have the largest dinosaur-to-people ratio of any town we stopped at on our trip along the Mother Road. The statues—made of various materials and styles—are scattered around town and each has its own unique story about how it ended up in Holbrook. Holbrook is in an area of Arizona that is filled with fossils from the Triassic Period. Petrified Forest National Park, 25 miles northeast of Holbrook, contains the fossilized remains of terrestrial vegetation as well as the remains of dinosaur predecessors Phytosaurs and Allokotosaurs. 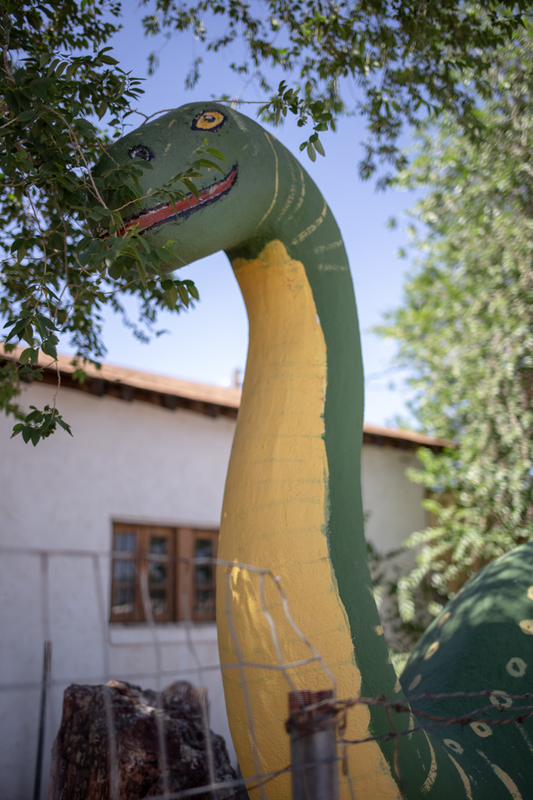 Located about a half mile east of the Wigwam Motel, the Rainbow Rock Shop is home to seven of Holbrook’s dinosaur statues. These concrete dinos were custom built by the owner over the course of twenty years, and they charge patrons to take photos with the prehistoric giants. I love their simple, cartoonish faces and they’re impossible to miss if you’re driving into, or out of, town. I should say that I’ve only read that the owners charge for photo ops, because we didn’t actually go inside of the Rainbow Rock Shop. We arrived promptly at 10 am to find the shop closed. I, meticulous road trip planner, somehow missed that they were closed on Sundays. Luckily, you can see the dinosaurs from the sidewalk and most of the shop by peeking through the chainlink fence. Rainbow Rock Shop is a souvenir shop that sells rocks, of course—Geodes each!—including petrified wood and other specialty rocks. I love the hand-painted signage, murals and low-tech, vintage vibe of the property. There is no shortage of options in the area to satisfy all of your specialty rock needs, but if you like to shop for your prehistoric souvenirs surrounded by roadside kitsch, the Rainbow Rock Shop is your place.